The Safeway at Georgia Avenue and Reedie Drive in Downtown Wheaton abruptly closed last month to make way for a mixed-use development that will take its place. In the meantime, however, the abandoned building remains as a boarded-up shell. When I visited last Friday afternoon, a lone bike was chained to a lamppost, and a mother taught her kid how to drive in the empty parking lot. This is known as a Marina Safeway, a design prototype the grocery chain used extensively across North America (here's one in San Francisco, and another in British Columbia) in the 1950's and 1960's. Fans of the Marina Safeway consider it to be an exemplar of Googie or Mid-Century Modern design, with its sweeping arched roof, minimal decoration, and plate glass windows. 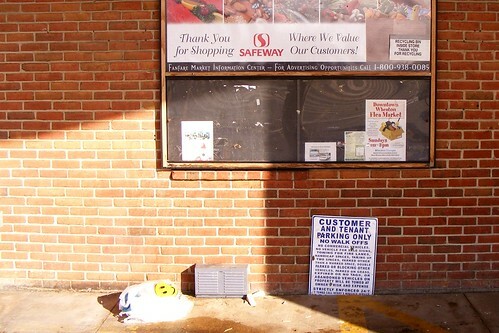 On Flickr, reader Stu_Jo asks where other Marina Safeways in the D.C. area are located. JUTP knows of the one on University Boulevard in Four Corners, photographed here by Googie adherent Sligo of Silver Spring, Singular, and one on New Hampshire Avenue in Colesville that was demolished in 2000. Where else have you seen one? Leave a comment or shoot an e-mail to justupthepike at gmail dot com. UPDATE: Here's a map of Marina Safeways in the region, based on locations given by our commenters. For more coverage of Wheaton's revitalization, check out yesterday's post. I used to shop here back in the day when I called 20902 home. They didn't always have what I needed, but it was the most convenient location for me - plus I always find Safeway employees to be super friendly and helpful. Thanks for the pics and the story. I didn't know about the "Marina" name. Interesting. There's one in Alexandria, among other places. The Staples in Montgomery Hills was once a Safeway and retains the roof. Georgia Avenue at Randolph Street NW in Washington, DC. 1 block north of the Petworth Metro (Green/Yellow). 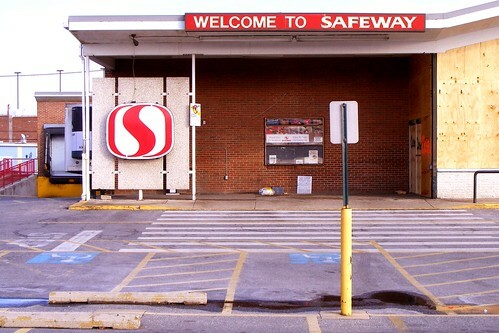 The old Kensington Safeway was also this style. 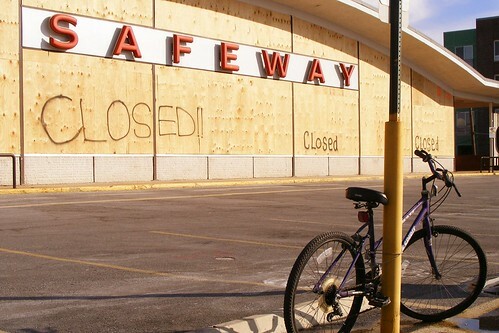 One last thing: all Washingtonians should be familiar with the local Safeway nicknames or risk looking ignorant. Back in the olden days nearly all of the Safeways were in that style. I was kind of amused when they expanded the Cloverly shopping area and the new parts had that arch which was a really nice architectural gesture to tie in the new buildings with the Safeway, but then they built the new Safeway without the arch. Ooops! 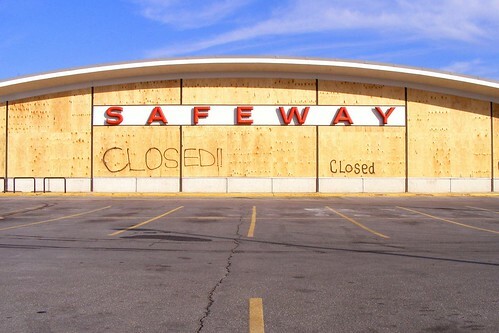 The Four Corners Safeway (located on Md. 193/University Boulevard West between Lorain Avenue and U.S. 29/Colesville Road) is somewhat newer than the postwar (1940's) neighborhood that backs up to it on two sides. One house on Lorain Avenue, odd side, where part of the Safeway parking lot is now, was moved Just Up the Pike (smile) on U.S. 29 to the corner of Columbia Pike and Burnt Mills Avenue (it stands there to this very day) at about the time that the Safeway was built. Getting back to the Four Corners Safeway, the building is about the same vintage as the Capital Beltway (early 1960's - Maryland SDAT says 1962, but I think that the store was opened a year or two later than that).